"Applicant communities are judged in five categories often referred to as the Five Es. These are Engineering, Education, Encouragement, Enforcement, and Evaluation & Planning. A community must demonstrate achievements in each of the five categories in order to be considered for an award on the Bronze, Silver, Gold or Platinum level. Communities with more significant achievements in these areas receive higher awards." Each of Georgia's BFC's have been awarded the Bronze-level award. Below you will find a brief description of each community, as well as links to helpful resources for visitors. We have also created a map of Georgia, featuring these BFCs and other great bicycling destinations in the state. Athens-Clarke County, located 70 miles northeast of Atlanta, is a bronze-level Bicycle Friendly Community and the home of the University of Georgia, the nation's oldest publicly chartered university. Athens has been recognized as "One of the Coolest Small Cities in America" by GQ (November 2010) and as the 2nd place Readers' Choice for "Best Local Music Scene in the U.S." in Budget Travel (October 2010). "Beginning in the late 1970s," notes Flagpole Magazine, "Athens became internationally known for its uncannily rich music scene, which over the ensuing decades has spawned and sustained such renowned and diverse artists as R.E.M., The B-52s,Widespread Panic, Vic Chesnutt, The Olivia Tremor Control, of Montreal, Drive-By Truckers," and many others. In addition to a vibrant music scene, Athens offers a wealth of independent retail, cultural, entertainment and dining opportunities. For more about Athens, visit http://guide.flagpole.com/. Columbus, located on the banks of the Chattahoochee River, is Georgia's second largest city by population. The vibrant Uptown Columbus business and entertainment district boasts public art displays and many local restaurants and clubs. Stop by Ride on Bikes to rent or outfit a ride, then explore the city's beautiful multi-use trails, the Riverwalk and Fall Line Trace. "The city of Decatur is four square miles of hometown hipness with 18,000 residents inside Atlanta’s I-285 perimeter highway. Ponce de Leon Avenue is our main street, connecting us to the city of Atlanta, just six miles to the west, and to historic Stone Mountain, just six miles to the east. A quintessential college town, we have Agnes Scott College, Columbia Theological Seminary within our city limits Branches of the Art Institute of Atlanta and DeVry University bring hundreds of commuting students, faculty and staff to our downtown square. Emory University is close by with a free shuttle carrying students and residents between campus and downtown Decatur. And with more than 200 mostly independent shops, restaurants, galleries, salons and other service businesses, Decatur draws students, office workers, residents and visitors who love to "shop local" in our walkable tree-shaded downtown." "Bathed in an intoxicating mixture of magnolia and moonlight, her classic beauty is unsurpassed. Cloaked in mystery and intrigue, her appeal is universal and her attraction undeniable. Like a true southern belle, she perfectly charms treasured guests with fascinating tales, southern delicacies, and gracious hospitality. Meet Milledgeville, the First Lady of Georgia. The fourth capital of Georgia, Milledgeville, was named for John Milledge, Governor of Georgia. Situated on the fall line of the Oconee River, Milledgeville was chosen because of its central location and ample springs." Peachtree City is an award winning master planned community envisioned as a community that would offer residents a better way of life through careful planning and design. 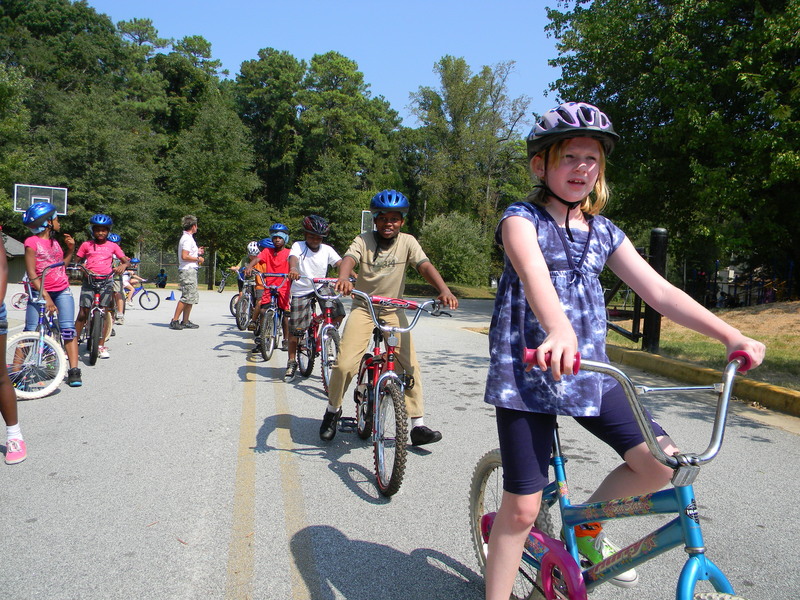 The bicycle friendly environment the City has developed is recognized repeatedly at the state and national level: Safest Cities, Georgia's Best Place to Raise Kids, Top 100 Best Places to Live in the U.S., Top 10 Cities for Families, Top Cites to Retire, and is located in the Second Most Healthy County in Georgia. 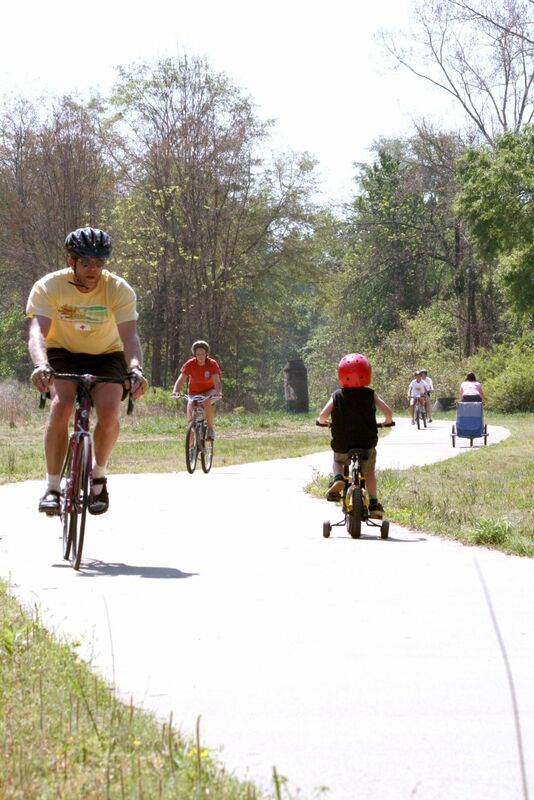 Peachtree City features over 98 miles of paved multi-use paths that are open to cyclists. Road rides to the surrounding rural areas and path rides are held several times daily year round, departing from either a local bike shop or park. The PAC Trails Bike Park at the Peachtree City Athletic Complex features pump and rhythm sections great for novice and beginner mountain bikers. The Davis BMX track routinely hosts State and Regional races, and now has a new pump track. The City of Roswell holds the distinction of being the first city in Georgia to receive the official designation of a Bicycle Friendly Community by the League of American Bicyclists. The city features the Roswell Riverwalk Trail which runs along the Chattahoochee River and connects to city parks as well as the Chattahoochee River National Recreation Area. Trails and popular routes also connect riders to the Roswell Historic District which features historic homes and some of the best dining options in the Atlanta area. Roswell is also home to the trailhead for the Big Creek Greenway which connects to the City of Alpharetta and features the popular Big Creek Mountain Bike Park. The city is also home to major yearly biking events including the Roswell Cycling Festival, GA400 hospitality century, the Bike Roswell! Mayor's Ride, the Big Creek Quick Six Enduro hosted by RAMBO and the Historic Roswell Criterium. With its 18th century street grid, pocket parks, breathtaking antebellum architecture and moss-draped oaks, Savannah is a bicycle tourist's paradise. There are multiple bike rental options, a local bike share program, bike tours, and even pedi-cab companies if you want to just sit back and enjoy the city at a leisurely bicycle pace without the pedaling. The local advocacy group provides free Bike Sav maps to help you choose the safest routes.
" Just a few miles east of Historic Savannah, Georgia, Tybee Island will tempt you with its eclectic style, thriving natural habitat, and easy-going personality. The terrain on Tybee Island is pretty flat, and the island is only 2.75 miles long, so you can get almost anywhere without gasoline. Tybee’s designated bike route is a combination of paths and safe streets, and is a great way to tour our neighborhoods. The beach and the scenic, six-mile long Old Railroad Trail along US-80 are also favorite biking and hiking spots."